Have used this app for years up until yesterday. Today, I can't use it any more as it crashes constantly after a few seconds. I've hard re-started my iPad and re-installed the app, but it doesn't fix the crashes! Typing in my login information just sends me back to the main page, un-logged in, unable to access the issues I’m paying for. This app serves zero purpose without this feature working and it’s pathetic that a major publication like TIME Magazine can’t get an iPhone app to work on the most basic level. I used to love reading Time. I would save up magazines and binge read on vacations. But the updated app no longer works on my iPad. So I either need to shell out $500 for a new iPad or stop reading Time. Not sure why they can't still have a version of the app that still works on older iOS since older iPads can't upgrade past a certain point. App will constantly crash. If I select an issue app shuts down. Have deleted and reinstalled app. Slow to download old issues. At various times during download app crashes. Signing out and back in does not help. Needs to be repaired. This happens frequently. I’m locked out of downloading even though subscription is paid through 2019. My subscription info doesn’t work when trying to access my account for assistance. Paid for the app but it keeps crashing. If you can’t read articles why pay for it? This app works great, content downloads quickly and was free with my print purchase. If you swipe up most content will switch to a format that is easy to read from my phone. No complaints. This app is terrible! Crashes constantly. What an awful app! Cannot delete issues after reading. You can delete them from download, but they still stay on face of app. Tried to send question to support but.....it crashed! will cancel subscription at its end because this app is just too darn frustrating to deal with. And now forcing me to use a nickname to submit this review! Ridiculous! Slightly Better Than Unbelievably useless! 7/23/18 Update After months of waiting for interactive improvements, they came and were better than expected, but... The app lost it's ability to keep its place between sessions, aka "most recently read". Thus the user has to re-scroll through to find where they left off reading. Bookmarks would be nice too. Want to stay in business? Start acting like it! 1/26/17 Update Time removed all their cool interactive bells and whistles (e.g., graphics, videos, etc.) from this app. Now it's a simple PDF in a "new, improved "smaller font! So small you have to manually enlarge every page to read it and shrink it back to get to the next page. Hey Time, this is supposed to be a "value add" app, not a "value less"! 2/16/16 Update It would be nice to be able to highlight text and bookmark them. 12/11/15 Update Bookmark management still lacking. It would be nice if the TOC showed the article the reader was reading when it is pulled down. 6/6/15 Update Bookmark management needs improving. The app doesn't allow the user to delete older bookmarks that reference an issue that THE APP deleted earlier because it was old! 3/16/15 Update Swiping from page to page has slowed considerably since your last update. I'm pretty sure it's the Time magazine app because others apps that swipe such as photos swipe normally. 2/7/15 Update Thanks for implementing some of my suggestions. Here's another one. Please add the complete article titles to the TOCs. When the user is reading an issue and presses the table of contents button. The TOC lists abbreviated titles, so abbreviated that the user is unable to figure out which article is which. 9/12/14 Update The "Most Recently Read" link doesn't always work, If you bookmark an article and then delete the magazine issue, the bookmark remains and can't be deleted! Item #4 below still not available. This is perfect example of an implementation that fell in love with its technology platform and lost sight of its purpose, namely enhance the reader's viewing experience. e.g., 1) All pictures require the reader to tap on a + sign to see the picture's captions. Personally I'd prefer to see the caption with the picture and turn it off in the rare instance I wanted to see something behind it. 2) If the user downloads a later issue, the app loses track of where the reader was in the previous issue. Te app should maintain an article history showing where the user was. 3) The app overuses the "pull tab for more info" feature. This isn't easy for disabled people. 4) It would be nice to be able to highlight and search text, bookmark articles and see definitions when you select a word. However the biggest problem is: How do you download the latest issue? It turns out you go to the apps "library" and select the issue you want to download. There should be an option to automatically download a new issue whenever your iPad is connected to the web. Suddenly the app does not work any more. Why? Definitely not renewing my subscription. If I’ve purchased the print version then I should get the digital version. Period. Want a daily dose of fake news and anti American news. Look no further. Used to have all sorts of extra content. They got rid of it. Probably cost cutting. Too bad. Like all print media, they're suffering, but this app has REALLY gone down hill from what it was originally. So much potential, just lost. This is basically for reading a PDF of the print edition. There are no extras, no links. This app would be OK were it not for constant crashing. Forget about reading anything--I can't even download an issue. Fix it!! We now live in a fake news era so brazen, the cover photo on Time magazine is a fake, a fabrication, a con, naked propaganda using a lie. If I wanted to hear opinions I’d just hang out in a bar drinking. Unfortunately you can not forward stories to friends. 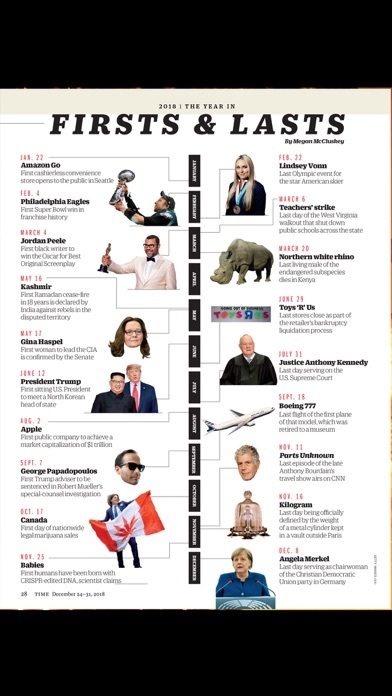 I used to love the Time Magazine app. It had great animated covers, videos and many more special interactive features. As it is, the Time app is nothing more than a PDF of the print magazine. Give us the interactive app back. 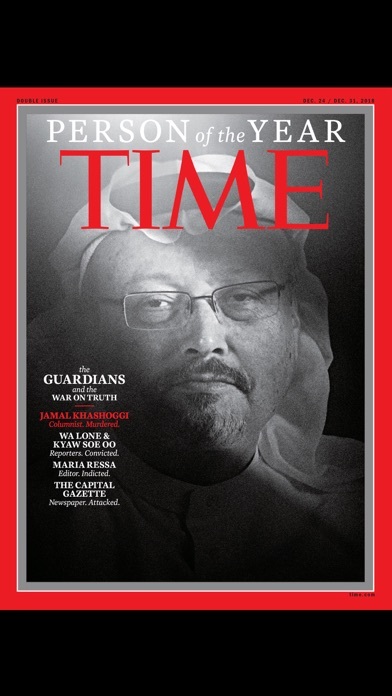 Love Time Magazine, long time subscriber. Also like reading in the traditional magazine view. However, the app is very slow to load, does not remember which issue I was reading, or what page I was on. Brand new iPhone 8+ and still takes me almost a minute to find where I was. It should remember at least what page I was on, and would be nice if it synchronized that across devices also. So sick of this anti trump bs. I am actually really impressed with his presidency so far and I find this anti trump media to be stale. Why can’t the app handle logins for my print edition. Sometimes works often doesn’t. Never remember s from one week to the next. This is not complicated in 2018 guys! I’ve been a print subscriber for years. Why do I need to pay more to be able to read my subscription on my iPad as well? Don’t fall for it! Having read the magazine for 30 years or so, the app is a catastrophe and a disgrace to the legacy of a once-great institution. When and if it works, the reproduction is poor and effectively a PDF. Deletion of past issues is a mystery, known only to a chosen few. Henry Luce would be ashamed. All started when a girl looking for school donations offered me a Time subscription for 50 cents per issue!...long time ago...then Time started offering their digital version along the printed one for the same price and they where doing a great job...until iTunes appeared offering just the digital version for a better price... I totally recommend it ! An automatic renewal option will be great. 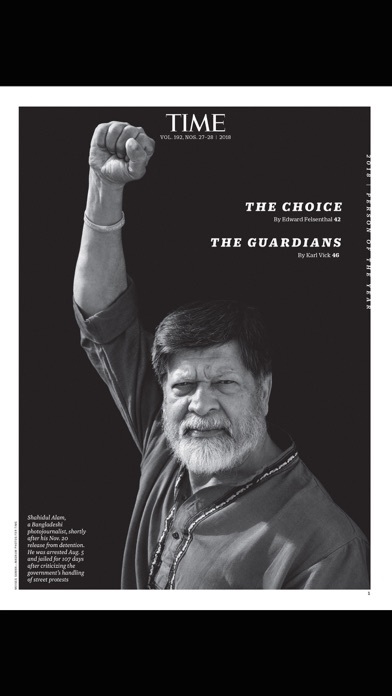 I am a print subscriber so I get the digital for iPad which I really like. My main gripe is that the system does not make issues available for download. I must play around with the app for several minutes - often logging out and back in - before it will display "download ". Until then it wants me to buy. Almost every week I must go through this and it's unclear what finally shakes it loose. I have deleted And downloaded this app several times and still I cannot open it and cannot read any articles. Every time a new issue co es out, I have to sign out and then sign back in again for the app to recognize that I have access to the issue and don’t have to pay for it. It has been like this for MONTHS and is extremely irritating especially since username and password aren’t automatically saved to iCloud Keychain. Please fix. This is stupid. I used to have the app to read TIME in the iPad : very intuitive, modern and nice. More or less a year ago everything changed= turned to something like a PDF... But the last was even worst: I just can’t download the app to my new iPad ! What’s happenning...? This is better than most magazine apps developed by so called Maz such as hbr, inc, Forbes etc. But still, magazines within this app are nothing more than scanned image files. Even a basic pdf has more interactivity and functionality. When I was using this app, I thought it was developed by some third parties who purchased Time copyright... It’s not 100% compatible with 12.9 iPad Pro and the contents are not selectable and copyable. Please put some effort on your App in the digital era. I still like Time but a while ago the format changed to a kind of two dimensional, flat looking document. The biggest problem is there is no marking pages for later reading. I get a few magazines on my iPad and this is the only one missing that feature. I like to browse the issue, mark pages, then read at my leisure. Now I have go through the whole issue and try to remember what I wanted to read. Another problem is the deletion of old issues. The process for this is clunky and confusing. C’mon Time, this isn’t hard stuff to correct. For some reason I cannot read downloaded issues when offline. This is a serious problem for me. Is this a glitch in the latest update or is it now policy that subscribers can no longer enjoy downloaded issues. I keep being able to read a preview but not the issues I have paid for unless I am online. What is going on? I’ve been a print subscriber for decades and digital issue reader for 6 or 7 years. The new PDF format is awful and making it worse I cannot read full downloaded issues if I am not signed in, can only read a preview. I am considering not renewing my subscription. Was good until they changed it… trying to be nice, but it really isn’t very good now. This latest update has made it almost impossible to read my favorite news magazine. Takes forever to load. Doesn't return to the same page next time you login. Settings don't give you any options over the app. The list goes on. Of course there is no way to return to the previous version that worked just fine for me. I wanted to support Time’s journalism and like to use apps to access sites. This one does not work well on a number of functions and I expect I will cancel my subscription. I can not access an issue until it is downloaded which takes a long time. My main beef is that you can not click on an article and go straight to the story. Very clumsy. The reader view does not work which makes it hard to read. I would have expected much better from this organization. I wish I could roll back to the last iteration of this app. The new one is incredibly slow and clunky. I’m not impressed with the reader mode and it’s annoying that it tries to remind me I can use reader mode on every article. The app seems to get periodic amnesia that I pay for a subscription and needs me to sign in again to download the magazines I want to read. It’s inconsistent in saving my spot if I close an issue wanting to come back to it later. They also did away with bookmarks without warning, so I lost the book reviews list I had kept in the app. Would love if Time would go back to two versions of this app ago... in 2016, they were creating issues optimized for iPad viewing with digital content. In 2017, I was disappointed that this was done away with, but at least the app was still useable. And now, I’m disappointed with the app altogether. I don’t mind the layout matching the print edition. However, how could you release an app without a bookmark feature. If I don’t read the entire magazine in one sitting, the next time I open the app, if there’s a delay of more than a couple of minutes, it opens on the cover page. Unbelievable that it doesn’t maintain where I left off an doesn’t allow me to set a bookmark. Come on guys, such an easy fix! If Time Magazine was serious about digital releases they would make a true digital version of their magazine, like they used to do. Covers are no longer animated, articles do not scroll. Digital TIME magazine is essentially a plain PDF, which I’m sure you could get for free online. Wow! A step backwards. Now is dead. Why mess with something that works fine? The update is slower and much less appealing. Please don’t update unless you like frustration, poor navigation and a less attractive product. Periodical of low hanging fruit. Trash. Sad to see how low the media has fallen. Worthless dribble. Are the writers outsourced from other countries? 12/18/18 Update Still waiting!!! 7/23/18 Update After months of waiting for interactive improvements, they came and were better than expected, but... The app lost it's ability to keep its place between sessions, aka "most recently read". Thus the user has to re-scroll through to find where they left off reading. Bookmarks would be nice too. Want to stay in business? Start acting like it! 1/26/17 Update Time removed all their cool interactive bells and whistles (e.g., graphics, videos, etc.) from this app. Now it's a simple PDF in a "new, improved "smaller font! So small you have to manually enlarge every page to read it and shrink it back to get to the next page. Hey Time, this is supposed to be a "value add" app, not a "value less"! 2/16/16 Update It would be nice to be able to highlight text and bookmark them. 12/11/15 Update Bookmark management still lacking. It would be nice if the TOC showed the article the reader was reading when it is pulled down. 6/6/15 Update Bookmark management needs improving. The app doesn't allow the user to delete older bookmarks that reference an issue that THE APP deleted earlier because it was old! 3/16/15 Update Swiping from page to page has slowed considerably since your last update. I'm pretty sure it's the Time magazine app because others apps that swipe such as photos swipe normally. 2/7/15 Update Thanks for implementing some of my suggestions. Here's another one. Please add the complete article titles to the TOCs. When the user is reading an issue and presses the table of contents button. The TOC lists abbreviated titles, so abbreviated that the user is unable to figure out which article is which. 9/12/14 Update The "Most Recently Read" link doesn't always work, If you bookmark an article and then delete the magazine issue, the bookmark remains and can't be deleted! Item #4 below still not available. This is perfect example of an implementation that fell in love with its technology platform and lost sight of its purpose, namely enhance the reader's viewing experience. e.g., 1) All pictures require the reader to tap on a + sign to see the picture's captions. Personally I'd prefer to see the caption with the picture and turn it off in the rare instance I wanted to see something behind it. 2) If the user downloads a later issue, the app loses track of where the reader was in the previous issue. Te app should maintain an article history showing where the user was. 3) The app overuses the "pull tab for more info" feature. This isn't easy for disabled people. 4) It would be nice to be able to highlight and search text, bookmark articles and see definitions when you select a word. However the biggest problem is: How do you download the latest issue? It turns out you go to the apps "library" and select the issue you want to download. There should be an option to automatically download a new issue whenever your iPad is connected to the web. It used to work. Now it does not! As described by many others, any attempt to download new issues takes you to a blank screen, then the app shuts down. While I’m sure that Time can fix this, until they decide to do so, I’ll delete this nonfunctional app. I downloaded the latest issue a few days ago. Today when I went to read it and tapped on the magazine the screen went white. I closed the app and reopened it & now can’t see issues & screen white. Evendeleted app & downloaded it again. Very frustrating to pay for an app that doesn’t work. Turns out you can do without it! encourage you to do the same until they come up with a decent version which won’t crash! App opens to a blank white screen after briefly showing cover images. Latest app update was a swing and a miss. Using it on my iPad, the app no longer opens to the page where I left off. Instead it opens to a list of news articles. From there you need to select “Issues”, then tap the issue you were reading and scroll page by page to find the page where you left off. At least with the print edition you can use a bookmark. With the latest version of the app I seem to no longer be a subscriber. Luckily, my one year subscription will end soon so I only lost a few bucks. I never liked reading the articles with the tiny font anyway. I always had to enlarge the articles and move around the page. The magazine will not be missed. At a time when other magazines are being inclusive and adding digital access for print subscribers, Time actually removes it for loyal customers. Terrible business model and good way to eliminate repeat subscribers. Still hoping for bookmarks!! Almost every time I reopen the app, it is back to the home screen and I have to find the page I left at. Also, as many have been stating the font is really small in recent digital issues. I have good vision but trying to read the long articles can get painstaking. I miss the interactive parts of the app, too. Please bring it back! I do like having the Time Magazine app, though ... My hard copies seem to make it to my APO address a whole month later. New version of app is useless unless connected to the internet! Old version worked perfect. Please fix this as the only time I read on the iPad is on an airplane, this is also when I don’t have internet. If they don't fix it, I'm gone! Latest update does not allow me to access previous downloads including the special issues I purchased through the app. The special issue purchases were on top of the subscription so I'm out those unless they fix it. Lost is the Library button to view personal library. Customer service pointed me to iTunes, iTunes pointed me to the app developer which is Time. No help! The app used to work great but certainly broken now. Go Back to the old version! The old app was soooo much better. This “new” version essentially is a pdf of the magazine with a poorly organized UI. The old app opened to a beautiful shelf of all the magazine covers. Simply just tap and go. This new app complicates things so much more and for no good reason. The app is far less clean looking. Deeply disappointed. This version of TIME has to show a red time screen to a long period before getting to the magazine. Then it crashes. Try to read for less tab an hour, forget it. It takes 10 minutes to get it to boot. Then it looses your place. Finally, loading a magazine takes forever and deleting must be done one at a time. Who programmed this thing? I need to go back to the paper copy! Whoever programmed this should be fired. I have been reading time for over 40 years. THIS will make me stop! Continues to frustrate. I am canceling my subscription. When downloading issues for offline use, clicking them when offline leaves you with a blank white screen. Useless on an airplane! New review: I live this new app. The new app is real mobile app and shows the content in mobile optimized view. I am 100% satisfied with the app and hope this app remains as it is and never get altered My old review: This is not a mobile app but just image of the paper magazine. I can't read the content because it is not optimized for mobile. I lost interesting in reading digital version. What happened to “swipe up for reader view”? PLEASE go back to the version you had for years, which was device friendly. Used to be Great! Now it’s just a photocopy. If you have had this subscription in the past you know how great it once was. It used to have interactive media. Now it's just a scrolling pdf. I recently subscribed again and wish I had not. I expect more from Time. It’s clunky trying to expand without moving to the next page or navigate at all. Why did Time choose to take such a backward step? No access to iTunes purchases since new app. Since updating to the latest app, I no longer have access to my subscription purchased through iTunes! I have restored my iTunes purchases, but that doesn’t work and none of them become available. Hard to believe that an app could be released without checking this! I contacted customer service last week and reported this issue, but the responses that I got have been largely nothing to do with the problem and of no help at all, it was as if they didn’t even read my emails, just sent standard replied. To repeat, I had no problem with the previous version of the app, since this one came out, even after restoring my iTunes purchases all of the issues covered by my subscription are locked. I have deleted the app, reinstalled and tried again many times. I have paid for my subscription, it is valid through January 2018 and yet I have no access to my issues! Tried again as I have done everyday so far to restore purchases and today it worked, have access to my subscription again! The older version of this app was easy and perfectly fine. Now I️ cannot even purchase or download a single issue. The only option it allowed me to select was to subscribe. So I️ then went online and paid $50+ for a subscription and then logged in on the app. It still did not work. I️ am still unable to purchase or download a copy of a single issue. This version of TIME has to show a red time screen to a long period before getting to the magazine. Then it crashes. Try to read for less tab an hour, forget it. It takes 10 minutes to get it to boot. Then it looses your place. Finally, loading a magazine takes forever and deleting must be done one at a time. Who programmed this thing? I need to go back to the paper copy! Whoever programmed this should be fired. 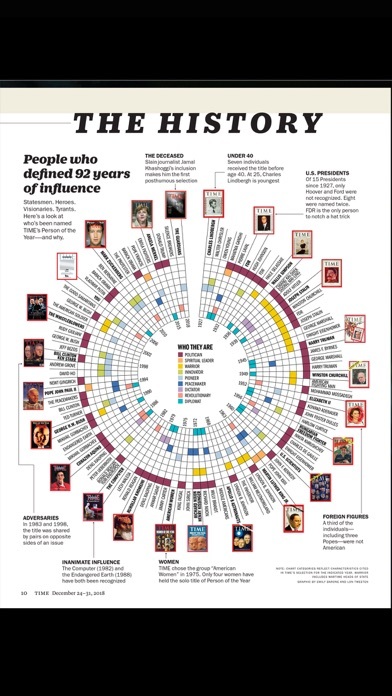 I have been reading time for over 40 years. THIS will make me stop! This is not a mobile app but just image of the paper magazine. I can't read the content because it is not optimized for mobile. I lost interesting in reading digital version. In the past, the iPad version was wonderful — 5 stars. Then they converted to pdf and it was so illegible that it was useless. Was 1 star but upgraded to 2 11/17 since you can now actually read it without a microscope. However, no bookmarks, doesn’t keep your place so you have to try to remember what you were reading, then actually try to find it, which is not so easy. Probably will not renew. 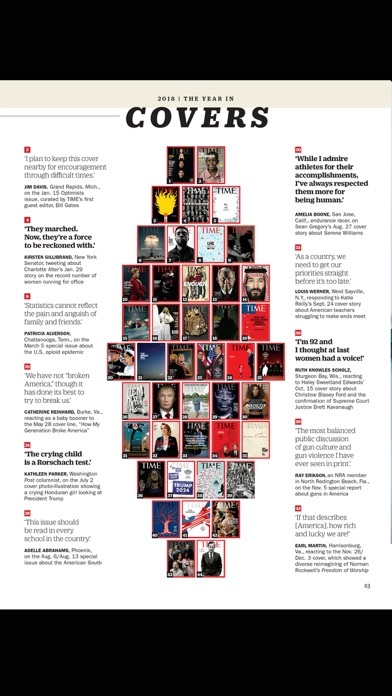 By the way, Newsweek is still very readable in the iPad format and holds your place. This update doesnt work on my iPad. Subscribed into 2018, but get only 15 pages per issue, with offers to extend subscription. "Restore purchases" does nothing. Asked to sign in, but email address not accepted. New version is much improved over the previous version that was a glorified PDF. The new reader view solves the issue of having to zoom to read articles and the pagination bugs appear to have been fixed. “New” app is merely a reader view—what?! Since updating to the latest app, I no longer have access to my subscription purchased through iTunes! I have restored my iTunes purchases, but that doesn’t work and none of them become available. Hard to believe that an app could be released without checking this! I decided to buy the app based on the free trial you get when you first download the app. What a sweet presentation that was full of dynamic news and graphs and charts you could manipulate and interact with. This is great, I though. The future of magazines. Content you can manipulate and see different views of. Then when you actually buys the subscription, what you really get is a high resolution scan of the actual magazine. Nothing to interact with, just the regular pages scaled down to an iPad. What a disappointment. The only reason I gave it three stars is the content is still OK to read so not a total loss. But this is not the future of digital magazines. Love the convenience of digital copies. Wish it covers more variety of topics. The app was just updated. After signing in and restoring purchases, tried to download an issue and it's stuck at 5%. Went to Settings and clicked on Send App Feedback and mentioned the same thing, but when I clicked Send, nothing happened. No confirmation of Send. I have no idea if they got my feedback. What a pain! Much happier with new TIME app that was just released. Landscape use on iPad feels natural and is easy to use. Double tap to zoom in on single page of two page layout, for text that is easy to read, and double tap again to zoom back out. Reader view for longer articles is clean & enjoyable to read. Finally have the ability (in Reader view) to select words & look them up in iOS dictionary, as well as save/share selections of text. Only remaining wish is to be able to save entirety of select articles (text & images) to Evernote for personal reference & easy search. Thank you TIME for the big upgrade! What don't I understand? I feel like I should be able to print out a copy of the article but I can't. Me or the app? With the latest update all I get is a blank screen! Seriously, bring back landscape mode. Navigating this app is anything but intuitive, getting to past issues impossible. I’ve read the print edition forever, but this electronic one is terrible. Saddest iOS experience ever. TIME phoned it in on this one. Sometime in December 2017 the Time iPad and iPhone app changed. This new app is a huge step backwards - user unfriendly, have to re-sign in to download, and it keeps indicating “Buy or subscribe to Time” even when signed in. Display is unwieldy. Bring back the prior version which was great. You will lose subscribers in droves if you don’t fix this. Look at your ratings... lots of 1’s and if there were a zero, I’d assign that. Another magazine whose online version has less features than a simple pdf... look at Magzter if your developers have no clue at how to develop a magazine app and learn how beautiful magazines can look on iPads... I just hope you’re not stuck to using Maz as your content delivery partner because that is the final nail in the coffin called time... I’ve just cancelled my print and online subscriptions in order not to feed the incompetence that is reflected through this publication... update your app and I will be back paying you again. This app stinks. I download issues, then they disappear when I’m offline so I can’t read them. The update from the old version was not necessary and made the experience ten times worse. I only use this because the new issue is available Friday, but the mailed copy doesn’t come until Monday or Tuesday. This magazine is going down the tubes. Time recently replaced its iPad app with a very different one. While the new one makes reading the magazine somewhat easier (including a “reader view”), it has a major flaw - you can’t see new issues unless you log out and in again each time! The old app would alert you when a new issue was available and made download easy. The new one won’t - and worse, when you look at the cover view for a new issue, you’ll see a lock icon and a demand for payment, even if you’re a current subscriber. In order to download and read the issue, you have to log out and then in again. Even after doing so, it exhorts you to subscribe, even though you are a subscriber! I contacted the app’s help desk, and they told me I had to uninstall and reinstall each time! (Thankfully that isn’t the case.) I can’t understand how such a serious usability flaw made it out the door, much less why it hasn’t been fixed in several months! The help desk was unhelpful when I asked what the plans were for fixing the bug. Did you fire your entire software team and replace it with a parrot? I have used this app for two years and it consistently fails to recognize me as a subscriber. It often does not recognize my account information and makes getting new issues impossible, even while I am logged in. Good magazine - horrendous app. Even if you paid for a year you can’t download new issues. I already wrote and call for help with no answer. I’ll need my money back. Have a subscription, will not let me download 2019 issues, only 2018 even though subscription does not expire until August 2019. If I could give it zero stars I would. I can't download the latest issue and will need to read the hard copy. Seriously!?!? What good is it then? And bookmarks would be nice. The app repeatedly signs me out. The latest issue often does not appear in the issue list. It crashes when I use the Help button. Comically bad. Have a lot of trouble getting new issues, even have them show up by snail mail before they are available in app. Seems to lose my subscription info every so often and I need to resign in. Finally, the swipe up for reader view does not work right if there are multiple articles on same page. Then every once in a while it just goes to an all white screen and you need to start over. I can’t believe that Time Inc could not find some competent developers. Navigation is clunky. Most importantly why is there no option to increase font size!!! That should be a basic part of the core functionality.